16 year old Teddy Girl, Eileen from Bethnal Green, with a Teddy Boy on an East End bombsite, January 1955. 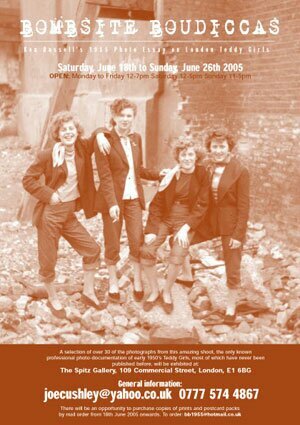 The original Teddy Girls (also known as Judies), like the Teddy Boys started in London. These were a group of feisty young women who were set on creating an identity of their own. The choice of clothes wasn't only for aesthetic effect - these girls were rejecting post-war austerity. By 1955 the concept of the teenager was gaining recognition in British society. Parents and teachers began to understand that teenagers had different desires, aspirations and lifestyles to adults. With 40% of London's population under the age of 25 and near full employment the newly affluent youth were well positioned to rewrite society's rules and replace the values of their parents with their own attitudes. 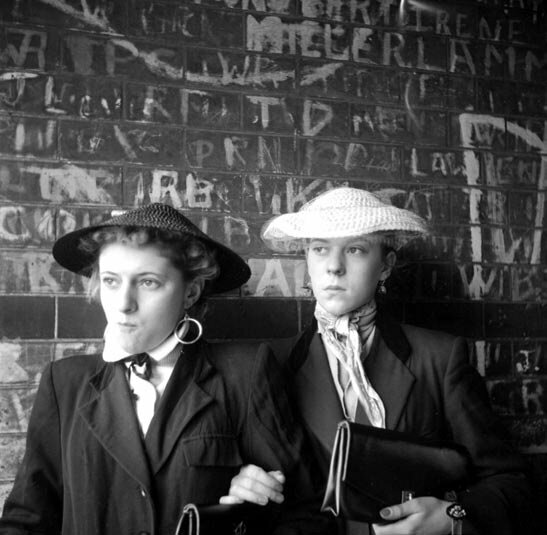 The Teddy Girls dress made them conspicuous on the streets of London. They wanted to be noticed, to stand out and they were reported on in the national newspapers. The fact that certain journalists were claiming they were delinquents didn't really bother them. 'Whatever?!' These girls style made a statement; we aren't kids and but we sure as hell don't wanna be grown ups. 18 year old Teddy Girl, Rose Price from Tottenham 'lights up' for her Teddy Boy friend. The London Teddy Girls were young working class women, often from Irish immigrant families who had settled in the poorer districts of London such as Walthamstow, Poplar and North Kensington. The girls would typically leave school at 14 or 15 and work in factories or offices. These were the first teenage girls to discover jeans. The Teddy Girls of North Kensington bought their American import denim on the Portobello Road pairing them with jackets borrowed from their brothers and ballet pumps. Whilst the East End girls, slightly older and with more money in their pockets, visited tailors to order single breasted jackets with velvet collars- a hallmark of Teddy Boy style. Not that these girls were trying to look like the boys. Far from it. The Teddy Girl juxtaposed these masculine items with feminine accessories; clutch bags, Victorian cameo brooches, perspex handled umbrellas [which were never put up] and straw conical hats. The resulting ensembles are a mash up of eras and influences. A look that embraced emerging American fashions whilst revering their English heritage. Teddy Girls from each district of London had their individual touches and individual styles. Elsie Hendon and her friends from North Kensington dress in jeans and jackets. Iris Thornton and Pat Wiles are photographed with conical straw hats and clutch bags. 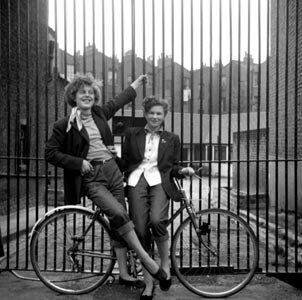 And two Teddy Girls from Walthamstow wear matching jackets. 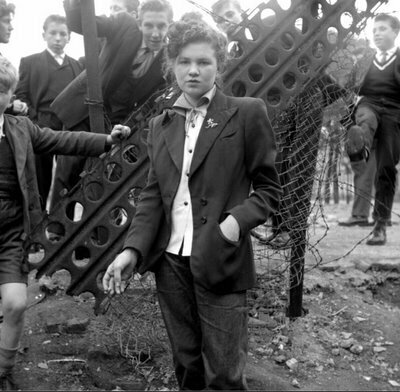 14 year old Jean Rayner surrounded by young aspiring Teddy Boys on a bombsite, January 1955. Teddy Girls from each district of London had their individual touches and individual styles to their clothing and shoes. Elsie Hendon and her friends from North Kensington dress in jeans and jackets. Iris Thornton and Pat Wiles are photographed with conical straw hats and clutch bags. And two Teddy Girls from Walthamstow wear matching jackets. The Teddy Girls would spend much of their free time buying or making their trademark clothes - pencil skirts, rolled up jeans, flat shoes, tailored jackets with velvet collars, coolie hats and long elegant clutch bags. 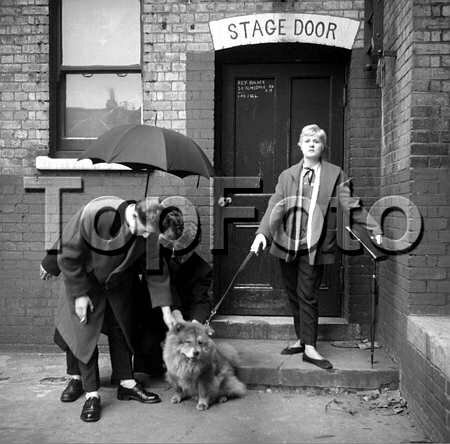 17 year old Josie Buchan with Teddy Boys at the rear of the Palace Theatre, High Street, London E17 in January 1955. The Theatre was sadly pulled down in 1960. It was head-turning, fastidious dressing, taken from the fashion houses of the time, which had launched haute-couture clothing lines recalling the Edwardian era. Soon the fashion had lept accross the class barrier, and young working class men and women in London picked up the trend. Teddy Girls Iris, Thornton and Pat Wiles, 17 year olds from Plaistow, showing Attitude, January 1955. "We got dressed up because it was always the Teddy Boys who got the look-in. We weren't being noticed by them." "It was our fashion and we made it up." 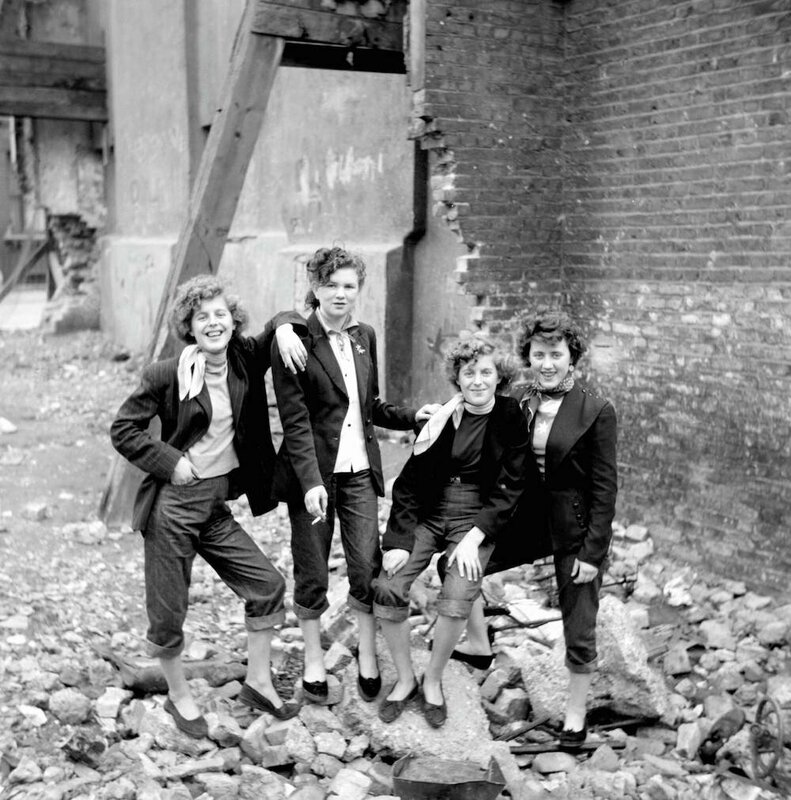 Elsie Hendon 15, Jean Rayner 14, Rosie Hendon 15 and Mary Toovey on a bombsite in Southam Street, North Kensington, West London. These young, feisty working-class women were the first generation of their social stratum and gender to express their financial independence and fashion acumen in such a forthright style. 17 year old Josie Buchan was a fashion student with Ken Russell's future wife, Shirley, at the college Russell also attended. Josie introduced Ken to her Teddy Girl friends. Here she shows off a thin black velvet tie and D.A haircut. It would have been incredibly rare to find a woman sporting this type of men's hairstyle back then. 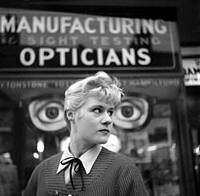 The settings of many of Ken Russell's 1955 pictures show the down-at-heel and often bomb-blasted neighbourhoods they hailed from, and serve as a fascinating counterpoint to the Teddy Girls gusty grace and sartorial inventiveness. 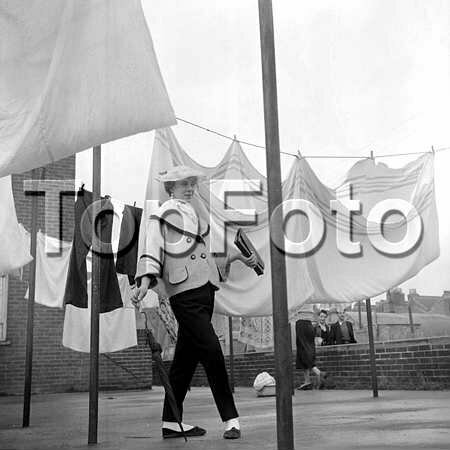 January 1955 Iris Thornton aged 17 posing in the backyard of the block of flats near where she lives in Plaistow. 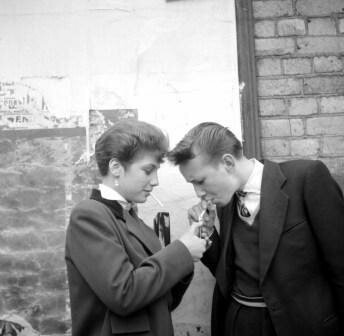 Ken Russell's photographs from 1955 of the original London Teddy Girls explode the myth that Teddy Girls were all circle skirts, pony tails and bobby sox; and also destroys the preconception that the style was inextricably linked to Rock 'n' Roll. January 1955 Elsie Hendon (15) and Jean Rayner (14) outside the Seven Feathers Club, where they did the popular Ted dance, The Creep. The photographs pre-date the arrival of Elvis, Bill Haley et al. These young women would have worshipped the likes of Ted Heath and his Orchestra. 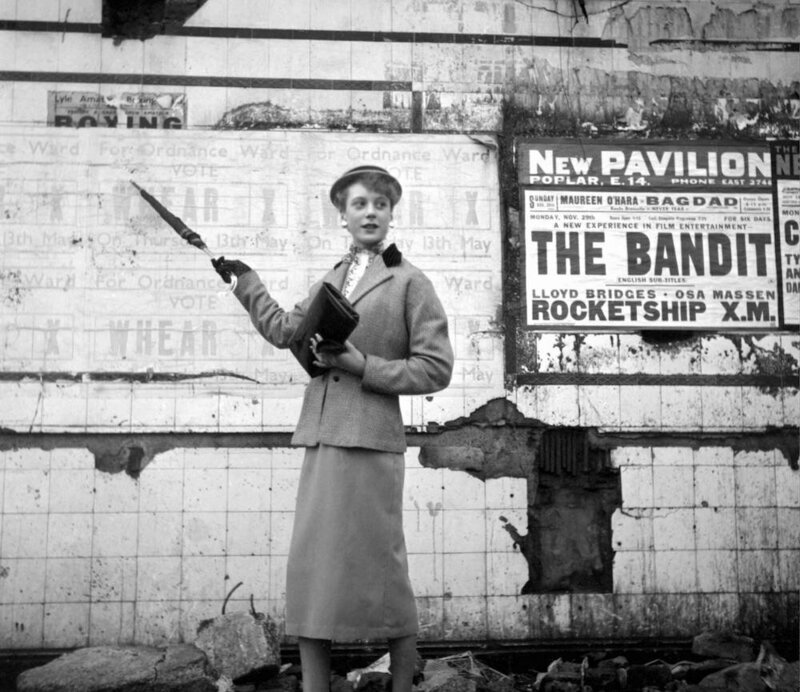 January 1955 Barbara Wood pointing to a council election poster for Ordnance Ward in Poplar, East London. Years later, well known London Teddy Boy, Johnny Tomlinson jives with original Teddy Girl, Rosie Shine (Nee Hendon) at the Bombsite Boudiccas Press viewing of Ken Russell's Photos at the Spitz Gallery, 109 Commercial Street, London E1 on June 22nd 2005.